The AnimationEditor just got a big update this weekend with the release of version 3.0. Most FlatRedBall developers have used this tool to create Animation Chain files (.achx), but a number of productivity issues have been around for many years. Version 3.0 directly addresses these issues. Now you can create animations much faster than ever before! Let’s break down some of the new functionality. One of the most common actions (and the very first action in a new file) is creating new animations. A new add button makes it easier to create new animations. Of course, the right-click menu is still available. The AnimationEditor now provides a drop-down to show you all image files which are available to the current .achx file. This dropdown is filled with images used in other animations in this file, files which are in the current screen/entity, and files in global content. The file name is listed first, then the full path after in case two files have the same file name. Of course, in most cases you won’t need to use the drop-down – the AnimationEditor will pre-select a texture for you when an animation is created or selected. The magic wand tool has been part of the Animation Editor for a while, but new changes have enhanced its functionality. When an animation is selected, selecting the magic wand and ctrl+clicking on the texture will add new frames. This functionality combined with the automatic selection of images greatly speeds up the process of adding frames to an animation. Notice that when the CTRL key is held, a small + appears next to the cursor to indicate that frames will be added. 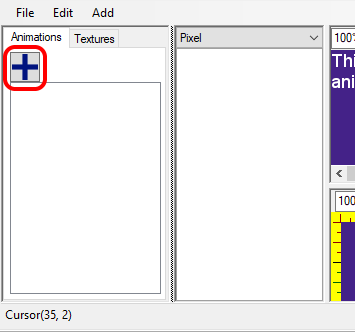 The AnimationEditor even shows you a preview of the selected region before you click with a faint orange rectangle. If you’re new to FlatRedBall and want to get started, hop on over to our Downloads page.